The Cast of It’s A Wonderful Life: A Live Radio Play. photo courtesy Pollard Theatre Company. This Christmas season, The Pollard Theatre is offering a new take on a well-known holiday story. It’s A Wonderful Life: A Live Radio Play is based on the timeless 1946 movie, which starred James Stewart and Donna Reed. Joshua McGowen stars as the down and out George Bailey, with Kara Chapman starring alongside him as Mary. 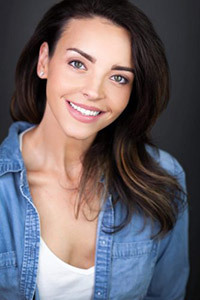 Kara Chapman stars as Mary Bailey in The Pollard’s It’s A Wonderful Life: A Live Radio Play. photo courtesy of the artist. 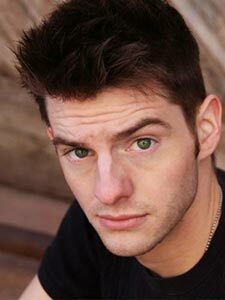 Joshua McGowen is the iconic George Bailey in The Pollard Theatre’s It’s A Wonderful Life: A Live Radio Play. photo courtesy of the artist. It’s A Wonderful Life: A Live Radio Play also stars James Hughes as Freddie, Timothy Stewart as Harry, and Kris Schinske-Wolfe is Lana Sherwood and Violet. David Fletcher-Hall is Clarence. 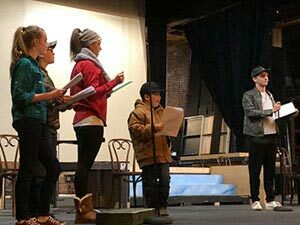 The child cast includes Ruth Daigle as Young Violet, Rianna Stottlemyre as Young Mary, Austin Barber as Young George, and Jaxon Pickens as Young Harry. Many of the actors play several roles. Sound effects provided by Foley artist Jared Blount. Scenic design is by James Hughes, costume design by Michael James, and sound design by Jared Blount. Stevenson is lighting designer and production director. It’s A Wonderful Life: A Live Radio Play opens November 23 and runs until the eve of Christmas Eve, December 23rd, in historic downtown Guthrie, 120 W. Harrison Ave, Guthrie OK. Guthrie at Christmas time is simply a must-see that you will want to come back for every year! For tickets, visit thepollard.org or call the box office at 405-282-2800. 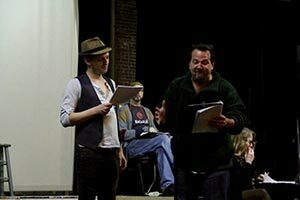 Joshua McGowen (L) and Timothy Stewart (R) rehearse for It’s A Wonderful Life: A Live Radio Play. photo courtesy Pollard Theatre Company.